Why is Serra Hinzman Soap more expensive than other goat milk soaps? Each Serra Hinzman bar of soap weighs a generous approximate 8+ ounces (approximately double the size of traditional bars), and each bar includes the highest percentage possible of NON-GMO goat milk and lucrative oils. Following extensive research, we have carefully created each individual recipe with the highest quality, freshest organic, GMO Free, natural ingredients to offer the healthiest benefit to the body. Even our pregnant and nursing goats are fed a costly organic and NON-GMO, soy free diet. 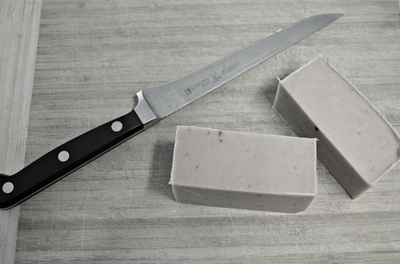 We are steadfast to our commitment to offer the safest and healthiest bar of soap we are capable of producing. We also carefully select product vendors that consider the ecological and social impact of where the products are grown and harvested and we are constantly searching to include ingredients that are obtained through fair trade practices. We offer no excuses for short-cuts and do not include oils such as vegetable shortening, Palm, Canola, Soy or Tallow (rendered fat from beef products). Taking our commitment seriously, we carry our pledge of good health through to the packaging of each bar using a safe, environmentally friendly, non-chlorinated, BPA-free paper against each bar. So, Serra Hinzman Soap is "organic"? No. Since soap is impossible to make without lye and there is no such product as organic lye. Organic soap is impossible to produce according to the USDA National Organic Program despite the fact that no lye remains in the final product due to the chemical reaction of soapmaking (saponification). Interestingly, Europe acknowledges this fact and allows their soap to be labeled organic. With the exception of lye, every ingredient chosen for each bar of Serra Hinzman Soap is organic, GMO Free or natural from our farm where no pesticides or synthetic fertilizers are used. A genetically modified organism (GMO) is an organism whose genetic material has been altered using genetic engineering techniques. Organisms that have been genetically modified include micro-organisms such as bacteria and yeast, insects, plants, fish, and mammals. GMOs are the source of genetically modified foods and are also widely used in scientific research and to produce goods other than food. Why isn't the soap brightly colored or strongly scented like other brands of soap? We exclude fragrance oils because they contain synthetic properties and artificial dyes which are contrary to adding any health value to soap. As to not compromise the integrity of our soap, we purposefully include only safe, natural ingredients, such as organic citrus fruits, herbs, spices and clays which not only are highly beneficial for our body, but also bring lovely tones and mild scents to the bar. If there is milk in the soap, won't it spoil? No. 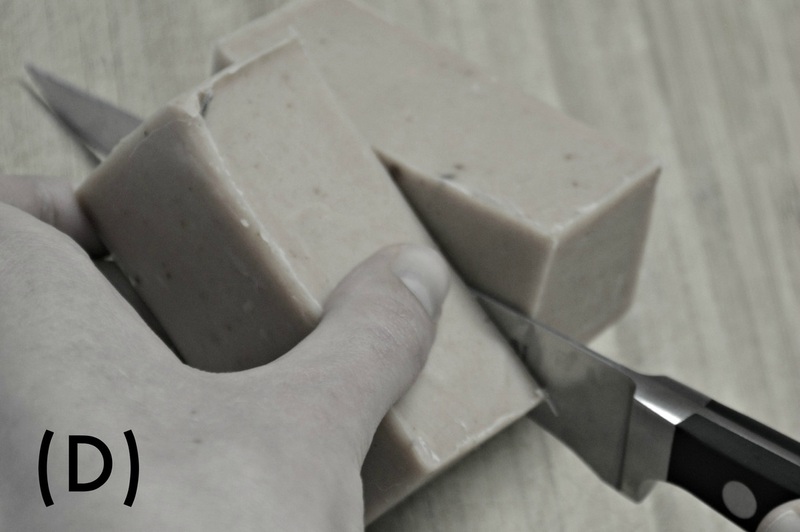 Saponification (the reaction of combining fats with lye) alters the goat milk in a way that ensures the healthy properties of the milk remain in the soap while eliminating any dangers of spoiled milk. What is the waxy-chalk-like film sometimes visible on the soap's surface? Soap makers commonly call this condition "ash." The ash appears on the surface of the soap while it cures has been identified as Sodium Carbonate - sodium from the sodium hydroxide (lye) and carbon dioxide in the air. This condition is not harmful and many people even prefer the rustic appearance. It will rinse away upon the first use of the bar. Once I begin using it, how long will a bar of soap last? We are proud to say our bars are long-lasting! 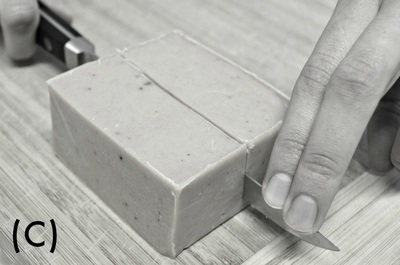 However, you can help your soap last longer if you allow your bar to dry after each use. Placing it in a soap dish designed to keep it out of water is beneficial. Because each bar is filled with luscious oils, an overly warm, humid atmosphere will soften the bar. I love the large bars of soap. But do they come in smaller sizes? Every bar of soap can be customized to your individual desired size. If you would prefer a smaller size bar for convenient travel or simply to sit elegantly by your sink as hand soap, you can easily slice your bar of soap with a sharp knife. (A) Gently place the blade of your knife across the soap where you prefer to make the cut. 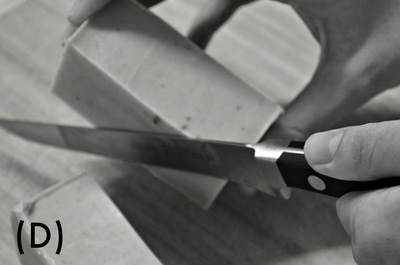 (B) Place fingertips on the top (dull) edge of the blade near the tip of the knife and firmly hold the knife handle in your other hand. 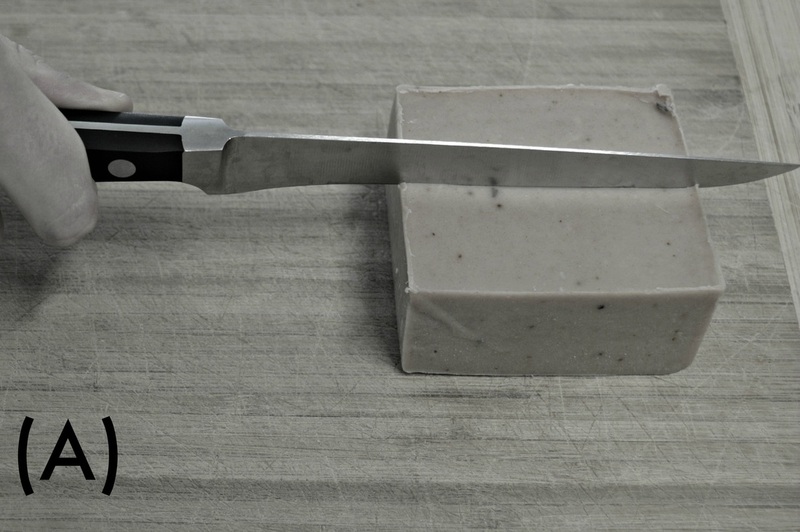 (C) Apply equal pressure to both hands and firmly press the knife through the soap. 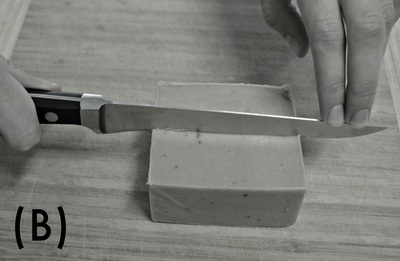 (D) Do not pull the soap away to separate from the knife blade, but gently continue sliding and twisting the soap until it releases.